Kundalini Awakening & the 7 Demons of the Chakras. Kundalini awakening is a very intimate and vulnerable experience. Oftentimes, it can be confusing—shattering every aspect of our lives and disrupting stable grounds, plans, and constructs we’ve previously established. However, once she is out of the box, nothing can stay the same. I was blessed—or sometimes, I like to say cursed—with two of these awakenings in the span of 10 years, which led me on a path of deep introspection, healing, and continuous chakra work. It’s an ongoing process that does not seem to end, since individual healing leads to collective healing; and from the personal, we progress to the family tree; and from there, the generations and the collective come next. The Bible speaks about Jesus ridding Mary Magdalene of seven demons, and since all scriptures are related to each other and have at their core the awakening of consciousness, there is a link from the Christian scriptures to the Hindu scriptures. The link is the chakras—and, of course, the serpent. Mary Magdalene has often been misunderstood as a woman and misinterpreted in her role at the side of Jesus. She has been depicted as a promiscuous woman with a negative influence on the son of God; so naturally, when Jesus rids her of “seven demons,” she goes down in history as a woman in a pact with the devil—someone who needed a classic Christian exorcism. But, what if everything in the Bible was symbolic? What if everything was a metaphor? Well, in fact, many stories in the ancient scriptures are metaphors, composed with a richness in symbolism, which helps to access deeper layers of the subconscious mind, rather than the conscious one. Jesus ridding Mary of the seven demons does not mean that he actually performed an exorcism; he simply released karmic seeds and conditionings from each of the chakras, so that Mary could take up the role at his side as a healer and leader, initiating their followers into higher states of consciousness in alignment with God. However, since higher states of awareness are only possible when we overcome the ego and understand its sneaky influence on our minds, healing at the core is needed. The more we get rid of the ego—which stands in between us and the world, in between us and pure cosmic consciousness—the stronger our healing capacities become, and the more light can flow through us, and thus spread outward into the world. Of course, chakra work only works when we go to the root—the root chakra. You see, half-assing our way through the chakras with a little color visualization and some Beej mantras can bring short-term effects, but it’s never gonna get down to the root cause, because that would take away the lesson we are supposed to learn by overcoming our challenges! I’ve been living and studying in India on and off for the past five years and have found my primary subject of interest in the Tantrik sytem of the chakras, due to the two Kundalini experiences I mentioned before, which made me question my whole life and the workings of my mind—and, of course, the ego. I found the chakras incredibly helpful in understanding the immense energy pulsating through me. When Kundalini energy is released, it’s not all fairies, light, and feathers; it requires facing our demons head on, in amplified measure. And not just one at a time—often, it’s all of them together, like a demon-slaying battle field. Instability? Amplified. Anxiety? Amplified. Relationship troubles? Amplified. Indecision? Amplified. Issues of willpower? Amplified. Issues speaking up? Amplified. Intuition? Amplified, but alternating with utter confusion. Spiritual connection? Amplified, but also alternating with suddenly feeling totally lost again. In my journey, this opening of Pandora’s box included demons I previously had no idea about, fears that were well-hidden, and false conceptions about life and what my purpose was (which seems to be changing constantly by the way) exposed in the blink of eye. It’s constantly taking me out of my mind and into the now, but in order to live in this world, it’s not the easiest thing to accept—let alone explain to anyone—because once I start talking about the challenges and experiences, people simply don’t believe me and look at me as if I’m crazy. But no, I’m not. I’m actually just hyper-aware of many things—energies, thoughts, my own issues amplified, other people’s issues, their thoughts, their troubles, the collective conscious on a larger scale, and energetic shifts. The root cause of all “evil” in our chakra system can be found in early childhood conditioning in our root chakra, where it spreads to the other chakras. The conditioning that influences our behavior, fears, anxieties, and doubts also holds the key to being a free and liberated being—a Jivanmukta as they say here in India. Because when we understand where the conditioning is coming from, we can stand face to face with the demons—and we can let go of them and transcend them, step by step, going higher up on the chakra ladder. Each chakra has its positive and negative traits, its high and low states of energy, and its unique influence on our body, mind, and spirit. The demons we hold in our chakras are our greatest teachers, as they challenge us to looker deeper into ourselves, our true needs, and wants, as well as our shadows, so that we can consciously decide to take necessary steps for change. So what are the “demons” of the chakras? The demons of the chakras are the emotions that keep us bound to suffering. And suffering, struggles, and negative experiences always refer back to the ego, as the ego wants to keep us where we are, not where God is. 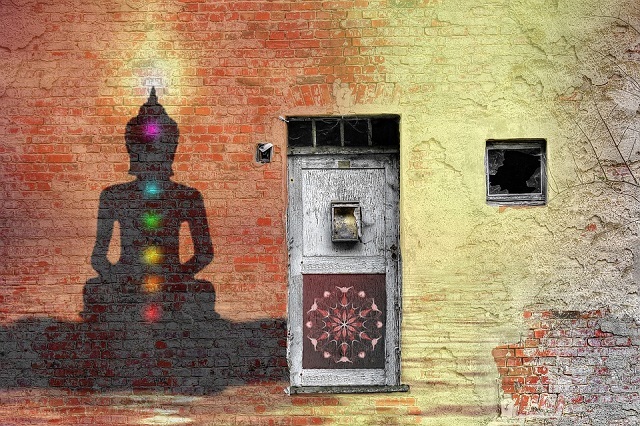 The more we become aware of the influence of the ego in each chakra—and therefore, in each area of our life—the easier it is to release the imprint. But, in order to do that we have to go back to the root. The root chakra is possessed by the demon of fear. Fear of not having enough, fear of survival, fear of instability, fear of lack, fear of the unknown, fear of addressing apparent family issues. Fear can come in many ways; oftentimes, it’s dismantled as disinterest (not wanting to change), boredom (not wanting to look and find excitement and purpose in life), comfort (not wanting to grow), indecision (not wanting to make a wrong move and take responsibility for that), and so much more. Fear is a sneaky ego move. The sacral chakra is possessed by the demon of guilt. Guilt from pleasure, guilt about our emotions, guilt of eating, guilt of joy, guilt of sensuality and sexuality—guilt from everything that makes us happy and gives us pleasure essentially. The solar plexus chakra is possessed by the demon of shame. Being ashamed of ourselves—and of our gifts and talents, brilliant ideas, inherent power, greatness, willpower, and strengths. The heart chakra is possessed by grief. Grieving binds us to the past and keeps a wound alive. As much as it is necessary for us to feel our grief in order to heal, grief also keeps the heart shut down from experiencing the love that is ever-present and surrounding us in each moment—the sunrise, the smile of a stranger, the lovely conversation with a vendor in a shop, the support and love of friends and family. The throat chakra is possessed by lies—the lies that we tell ourselves, the lies we buy into from our own conditioning and society, lies to our parents or partners, the lies we tell when we fear to speak our truth, and the sneaky little white lies. The “third eye” chakra is possessed by delusion. So many of the awakening, searching spiritual seekers want to open their third eye, as so many challenges are to be faced here. It’s the place where the spiritual ego gets the strongest, and then turns clarity and focus into delusion, illusion, and spiritual superiority—thoughts of being better than, knowing more than, or having accomplished more than. So, exactly the opposite of what the path of self-realization is all about. The crown chakra is possessed by attachment. What is the last thing that keeps us tethered and bound to this life’s experiences—and therefore, suffering and drama? It’s attachment. We become attached to so many things—material things, places, love, partners, achievements and goals, spiritual experiences, and even to intuition and higher guidance. Everything can become an attachment—and to be fully prepared to let go of all of that, being able to rebirth oneself each moment (without the ego sneaking back in and silently gripping us) is a true miracle. These are the main demons of each chakra. Of course, since we as humans are extremely complex, there are many smaller demons alongside the main ones. But, these main ones are the guides for each chakra—and the deeper we can look into these main demons, the more we will be able to see the hybrids of each of them, and then see how they play out in our lives. The more we become aware of them, the easier it is to release them. The greatest remedy for releasing demons is meditation. Becoming aware of what is going on inside of us—and then sitting with it—is one of the strongest practices I’ve experienced. Meditation gives us the gift of clarity. It opens up a space in which everything is allowed to bubble up and be seen and felt. Everything that is normally stuffed down and pushed under the carpet comes to the surface. Once it is on the surface, faced with an open mind, and felt with an open heart, we can then understand the lesson and release it. Oftentimes, the simple act of seeing the emotions and challenges naturally brings a shift, and our issues start to disappear on their own. Give it a try next time a demon shows up. Sit with it, let it be, and then watch it go. The Basics of Kundalini: Awakening our Serpentine Energy. 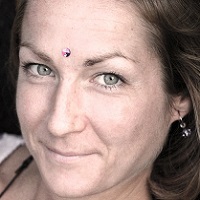 Anne Haack is a chameleon, yoga teacher, holistic healer, movement facilitator, dancer, artist and DJ. With a background of 17 years in yoga and healing practices, she uses creative meditation techniques, bodywork, art, and music as tools for transformation and to kindle everyone’s innate life force. She is the founder of Mala Magic jewelry, Just Dance, conscious dance in Rishikesh, India, and Desert U Retreats, transformational retreats in the Sahara Desert of Morocco. Catch up with Anne on her website, Facebook, and Instagram.